The Still Creek watershed covers an area of approximately 28 km2 within the Cities of Vancouver and Burnaby. It is a highly urbanized watershed with a population of over 100,000 residents. Throughout its recent history, Still Creek has been channelized and enclosed and bears little resemblance to the original waterway. “Over many decades, people in the area have worked tirelessly to help bring the creek back to health. In November 2012, for the first time in around 80 years, a large number of full-size chum salmon have been observed returning to spawn in many parts of Still Creek,” states Mark Angelo, an internationally-celebrated river conservationist, writer, speaker, teacher and paddler. Mark Angelo is Chair Emeritus of the Rivers Institute at the British Columbia Institute of Technology (BCIT). He is the founder and chair of both BC and World Rivers Day and is an ambassador for the International River Foundation. 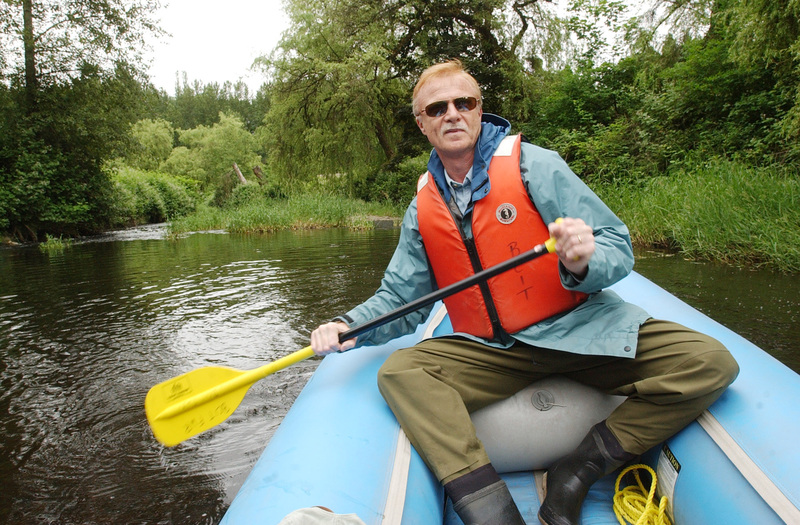 Mark has received the Order of British Columbia and the Order of Canada in recognition of his river conservation efforts. Still Creek arises in western Burnaby, just north of Central Park. From there it flows northwest into Vancouver, and then north. For years, the entire stretch from Central Park to 29th Avenue has been culverted as part of the City of Vancouver’s storm sewer system. Across the street from the 29th Avenue Station, the creek emerges into the open, and runs north along the bottom of the Renfrew Ravine. After running under the intersection of 22nd Avenue and Renfrew Street, the creek runs through the park beside the Renfrew Community Centre. It then is culverted again for several blocks, emerging just before the Grandview Highway, where it turns east, towards Burnaby. From Renfrew Street in Vancouver to Gilmore in Burnaby, Still Creek has been channelized for most of its length, and culverted for the rest. East of Gilmore, the creek has been left in a mostly natural channel, and for the last kilometre or so before Burnaby Lake, the land on either side of the creek has been protected from development. Click on http://www.riverfoundation.org.au/articles/still_creek to view an inspirational 4-minute video that tells this remarkable story of urban stream restoration. For details of the plan, see the Still Creek Rehabilitation and Enhancement Study.